In the far north, deep in the arctic circle, lies the frozen island Heorik. A wild and unforgiving place with dark forests, cold granite mountains and hard scrabbled earth covered by dense, uneven fields of ice and snow. Once, long ago, a powerful northern kingdom ruled the island, uniting the four shores, but a series of devastating quakes destroyed the kingdom, and cast its cities into ruin. Generations passed and the once proud civilization withered. Now only one major city remains – Haugerbain – a broken shadow of its former glory. A decaying stronghold of rock and oak in the center of the blighted landscape. The poor but hard working people of Haugerbain live short lives hunting game in the nearby forests and gathering whatever the harsh land will yield. They are survivors of a forgotten kingdom trapped in a world that has moved on. Except Brom; a lone, lordless warrior who is perhaps more harsh and unforgiving than even the land itself. 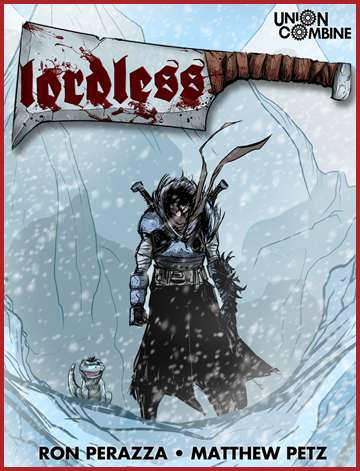 A free, hack-and-slash digital comic by Ron Perazza and Matthew Petz. Available on iBooks (with behind-the-scenes bonus material) and Online.